Build Tiny – a tiny house builder in New Zealand – is using a purpose-built tiny house trailer manufactured by Bay Engineering Solutions to offer their customers tiny houses that detach from their trailers. House is considered a load on a trailer – not a trailer itself, simplifying the registration and insurance because it would fit in the current norm. Trailer can be removed for aesthetics, inspection, or maintenance. House can be reversed to face away or toward the trailer tongue – useful for positioning a house in a tight space. The trailer and house are made from lightweight galvanized steel making them easy to tow with a wider range of vehicles. House could be more easily sited on a permanent foundation using the standard shipping container locks. The low profile wheels allow the house to have a flat bottom with no fender bump-outs in the floor and wall. Photos and videos via Build Tiny. Pictured below are more photos of the trailer and The Boomer by Build Tiny. Above: The trailer is rolled out from under the flat floor deck. Below: House jacks are used to lift the house off the trailer. Below: Standard shipping container locks are located at the 4 corners and secure the house to the trailer. Below: The Boomer by Build Tiny. The loft inside The Boomer. Below: The living room and storage stairs in The Boomer. Below: So lightweight the house can be towed by smaller vehicles. 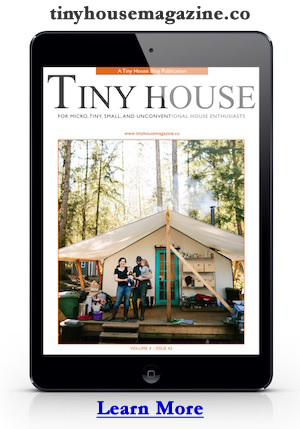 Learn more about Build Tiny. This entry was posted in Builders, Trailer. Bookmark the permalink. I wish this was available in the United States! Me too. I’m pinging my tiny house trailer manufacturer friends. They should build something like this here. What happens to all the plumbing under the house? Doesn’t it get caught up in the trailer? I think it all stays in the floor and probably has side outlets for drains. But excellent question.